Researchers have discovered a deep saltwater ocean on one of the many small moons that orbit Saturn, leading scientists to conclude it is the most likely place in the solar system for extraterrestrial life to be found. Gravitational field measurements taken by Nasa’s Cassini space probe revealed that a 10km-deep ocean of water, larger than Lake Superior, lurks beneath the icy surface of Enceladus at the moon’s south pole. The presence of a saltwater ocean a billion kilometres from Earth more than satisfies Nasa’s long-held mantra of “follow the water” to find signs of alien life, but water is not the only factor that makes Enceladus such a promising habitat. The water is in contact with the moon’s rocky core, so elements useful for life, such as phosphorus, sulfur and potassium, will leach into the ocean. The first hint that Enceladus might harbour a subterranean ocean came in 2005 when Nasa’s Cassini spacecraft photographed extraordinary jets of water vapour blasting out of fissures in the moon’s south pole. The source of the water was a mystery, and an ocean of liquid water was only one possibility. The latest discovery, reported in the journal, Science, gives scientists the strongest indication yet that the source of water vapour coming from Enceladus is a large body of water underneath the surface of the icy moon. An international team led by Luciano Iess at the Sapienza University in Rome inferred the existence of the ocean after taking a series of exquisite measurements made during three fly-bys between April 2010 and May 2012, which brought the Cassini spacecraft within 100km of the surface of Enceladus. As Cassini sped past the Saturnian moon, researchers used Nasa’sDeep Space Network of giant antennas to monitor signals reaching Earth from the spacecraft’s onboard radio. They looked for subtle shifts in the frequency of the radiowaves, which revealed whether the spacecraft was speeding up or slowing down. The measuring technique exploits the Doppler effect, which explains why the siren of a police car has a higher pitch as it approaches, and a lower pitch as it heads away. Cassini, the scientists discovered, sped up and slowed down by a few millimetres per second as it flew past Enceladus. Some of the change in speed was down to variations in the gravitational field of the moon as a result of different densities of material under the surface. After taking account of other factors that could alter the spacecraft’s speed, such as drag from the plumes of water vapour, and even the modest pressure produced by sunlight, the researchers created a map of the gravitational field of Enceladus. The shape of the gravitational field pointed to something more dense than ice – but less dense than rock – deep beneath the south pole of the moon. “Given the kinds of materials we know are used to make bodies like this, the natural thing to look for is water, because water is more dense than ice, and because it’s a natural thing to have in that environment,” said Stevenson. 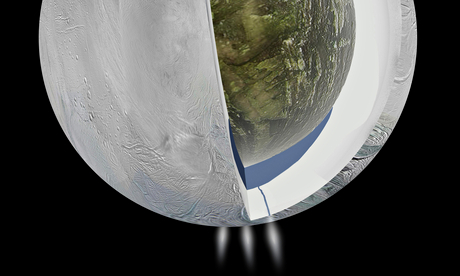 When scientists first speculated that Enceladus might contain an ocean of water, one of the greatest puzzles was how the ice could be heated to make liquid water. Stevenson and his colleagues believe that gravitational forces that act on Enceladus as it orbits Saturn essentially knead the planet, producing enough heat inside to melt the ice. The process is known as tidal heating. Enceladus is not the only moon in the solar system to have a subsurface ocean. Europa, a much larger moon that orbits Jupiter, has a more extensive, global ocean under the surface. But Enceladus has excited scientists because the vapour plumes from the south pole are known to contain organic molecules. These, along with basic elements, a source of heat and liquid water, make Enceladus a prime candidate in the search for alien organisms. In 2008, Nikolai Brilliantov, a mathematician at Leicester University, worked out how water vapour jets might blast out of Enceladus if it harboured an underground ocean. Confirmation of the ocean made Enceladus the most likely place so far to find extraterrestrial life. “There are definitely regions on Enceladus where the conditions are such that life could exist. You have liquid water, you have chemicals and you have heat. And that is enough for life. To my mind, this is the best place we can expect to find life elsewhere in the solar system,” Brilliantov told the Guardian. Writing in the journal Astrobiology this week, McKay makes the case for an Enceladus flyby mission to return samples of the water vapour plumes and look for biomolecular evidence of life. “With samples of the organic material from the plume, we could search in terrestrial laboratories for organic biomarkers that would be conclusive evidence for life,” he writes. Previous Pakistan: Where Do You Want To Be In 25 Years Time?